The Blue Comet addon pack recreates the excitement and splendour of this remarkable train. Stunningly detailed and making use of up to date smoke, sound, physics and script features, the Blue Comet promises to be a satisfying addition to your Trainz collection. 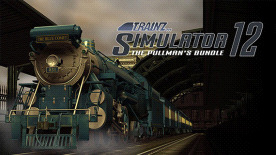 Trainz Simulator 12 includes the most exciting new feature in the history of Trainz. You guys asked for it, and now we have delivered! Players from all over the world can build, play and operate railroads together in this new and exciting experience!